This is my latest work that the HawkEye, an online news magazine, was generous enough to publish. The original version was over twice as long, so I might get the longer version out there as well when it's ready. Masha Gessen, one of my favorite journalists who covers Russia, has a very interesting piece in the New York Review of Books. All the way back in July, when Trump was the Republican nominee but still seemed like a long shot, she was writing that we (Americans) need not look to Russia and Putin to try and understand Trump. We need to be considering the possibility that he will become president, and what to do about that. Looking back on that article now, it's strange to see how prescient Gessen's words were. In her most recent article she makes the very reasonable argument that while we are understandably going down the rabbit hole of conspiracy theories concerning the Trump administration and the Russian government, there are far more pressing matters that are not getting the coverage they deserve. I'm also keeping my eye on the prolonged political crisis in Macedonia, which still has no functioning government and no end in sight to a political stalemate. In the US media the Trump-Russia saga is dominating coverage, and there certainly is a lot to unpack. Meanwhile, new stories about Russia's interest in foreign elections continue apace, especially with respect to the Balkans. There are a few older articles on here that I just happened upon recently, including yet another story on the factory of fake Trump news that is Veles, Macedonia. If you only have time for one, and are interested in Macedonia, I highly recommend the piece from Jacobin about the Macedonian election. The Internet is an ocean of information, which can make it difficult to know where to look when you are interested in a topic. As evidenced by the popularity of fake news (actual fake news, not merely critical news), it is apparent that many people not only do not know where to look, but they lack a basic capacity to discern between legitimate and dubious sources. I certainly learned that lesson long ago when I was teaching upper-level college students how to properly research an academic paper. With that said, I will start posting links to what I think is the best writing about politics and society as often as I can. The list may grow throughout the day. As will become apparent, I have a heavy interest in Eastern Europe, the rise of illiberal democracy and authoritarianism, and American politics. So if that's not your thing... what are you doing here!? 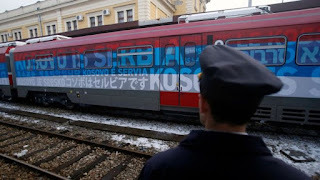 It says "Kosovo is Serbia" in over 20 languages, and the colors are of the Serbian flag. Anyone who knows anything about the region knows that this is an obvious, and potentially dangerous, provocation. To what end is anyone's guess, but it certainly seems plausible that the Serbian government is trying to find out if Trump was really serious about his intention to re-evaluate the US relationship with NATO and its other commitments abroad. During the campaign, and bizarrely during the inaugural address, Trump touted his "America first" policy. Part of that policy refers to trade, but it also refers to rethinking the global leadership role that the country has taken since WWII. In the case of the Balkans, that could mean significantly reducing the American military presence from Kosovo, or withdrawing completely. Indications of what the future could hold came a few days ago when General Mattis, Trump's new Secretary of Defense, argued that it's time for Kosovo to have its own military and defense capabilities. Since the NATO intervention of behalf of Kosovo Albanians in 1999, that responsibility has largely fallen to the US military. I know that Trump is a popular figure among my many Macedonian and Serbian friends. Indeed, the prospect of withdrawing from Kosovo and allowing Serbia to re-open that discussion on its own terms is a big reason why. The assumptions seem to be that 1) Kosovo will go back to the way it was before 1999, and 2) Albanians will not have all the "rights" they have now. Given Trump's erratic decision making, and his life-time of negotiating deals exclusively on his terms, I think it is prudent to remember: be careful what you wish for. If we are take General Mattis at his word, the United States would leave behind an armed and trained Kosovo military, not the rebel militia that Serbia faced in 1999. So yes, NATO's presence and the direct support of the US military would be diminished, but Kosovo's ability to defend itself would be considerably improved. A military confrontation would no doubt draw in Macedonia and potentially Albania, at the very least, and would do nothing to improve Serbia's standing in the world. Furthermore, his statements do not suggest any policy change regarding Kosovo's independence from America's perspective, which is ultimately what Serbia wants. Under those circumstances, Kosovo would continue to receive recognition from many Western countries, it would continue to assert its own independence, and Serbia would not get what it wants without taking further action. Neither potential change, or lack thereof, is particularly favorable for ethnic Serbs and Macedonians, despite the one-sided optimism that exists at the moment. Freedom House just released the updated freedom scores for 2017. The agency comes up with a scores based on a country's political rights and civil liberties, including freedom of the press. As far as Macedonia is concerned, there is a mix of good and bad news. On the good (?) side, Macedonia is not the lowest rated country in Europe! That honor goes to Kosovo, with a score of 52 out of 100 (a higher score indicates more freedom). Following Kosovo is BiH with a score of 55, and then Macedonia with a 57, giving it a "partly free" designation overall. The report finds that there are slightly more civil liberties than political rights, but also rates the press as "not free." For anyone who is familiar with life in Macedonia, that should come as no surprise. Sweden, Norway, and Finland, by contrast, posted perfect scores (100/100), while the United States scored an 89, in large part due the decision to walk back portions of the 1965 Voting Rights Act and the increase in restrictive voter ID laws. Macedonia, along with some of its Balkan counterparts, lost points because domestic leaders "harassed civil society critics, obstructed investigations of government wrongdoing, and ignored constitutional procedures even as EU accession talks went on." Much of what they are referencing is the increased effort to "stop Soros," which means targeting any reform-oriented or liberal leaning NGOs that may criticize the government or advocate for change in policies. The government and its allies portray such efforts as foreign attempts to destabilize the country. From my own anecdotal evidence, I would also add that in Macedonia political figures openly attempt to influence what is posted on social media by threatening the employment status of private citizens, creating a self-censored climate of fear. As if there were a need for further confirmation that things in Macedonia could be, uh, better, this report just adds to the mountain of evidence.